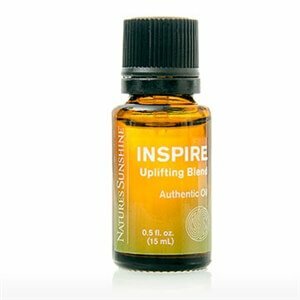 Nature’s Sunshine Inspire Uplifting Blend provides the refreshing scents of citrus and cooling mint to awaken the senses, while spicy undertones provide the fire needed to uplift, motivate, and inspire you. This blend features pink grapefruit, orange, lemon, spearmint, peppermint, cinnamon, bergamot, ginger, and vanilla. Instructions: Essential oils may be used aromatically or topically in a variety of ways including diffusers, massage, compresses, baths, scrubs, lotions and sprays. Essential oils should be diluted with Nature’s Sunshine Massage Oil or Carrier Oil before applying topically.